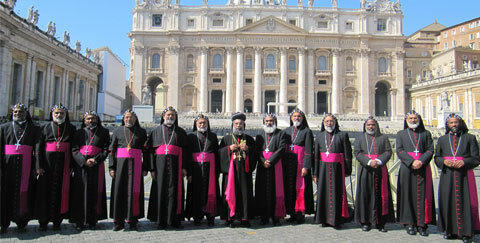 The Syro-Malankara Catholic Church has about 500,000 members, predominately in Kerala state, India. It follows the west-Syrian Rite and the liturgy of St. James of Jerusalem, and forms part of the Thomas Christians who trace their initial evangelization to the Apostle Thomas in about the year 52 AD. From at least the 8th century, the Metropolitan of the autonomous Thomas Christian Church was a hierarch in the Assyrian Church of the East, their closest ecclesiastical neighbors. The Thomas Christians held that communion was maintained, if communication lost, with the Catholic/Orthodox world until the arrival of Tridentine-era Portuguese missionaries at the end of the 15th century, who began a program of Latinization. Resistance to the imposition of western culture and ecclesiology culminated in 1653, the symbolic date for the breaking of communion and the eventual breaking of the once-unified Christian Church in India into its current situation, divided among those in communion with the Assyrian Church of the East, the Syrian Orthodox Church, Malankara Orthodox Syrian Church, the Malankara Mar Thoma Syrian Church (Anglican), the Syro-Malabar Catholic Church and the Syro-Malankara Catholic Church. The latter traces its origin to the corporate reunion of some Malankara Orthodox Syrian bishops and faithful starting in 1930. 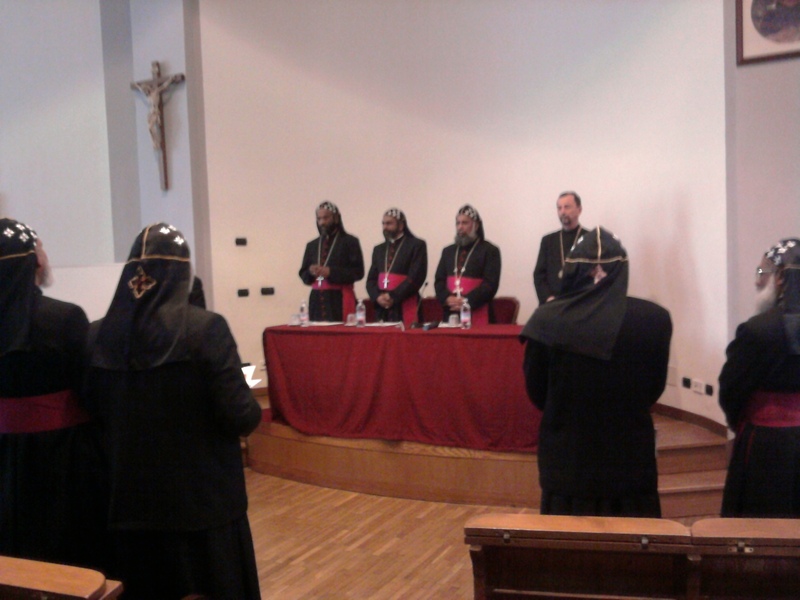 The bishops met with Pope Benedict XVI this morning, and this afternoon were gathered at the Angelicum for a lecture offered by one of their number, Bishop Thomas Mar Anthonios, entitled, “New Evangelization: The Mission and Role of the Syro-Malankara Catholic Church”. The text is basically a synopsis of the lineamenta prepared for the first-ever Major Archiepiscopal Assembly scheduled for later this year. 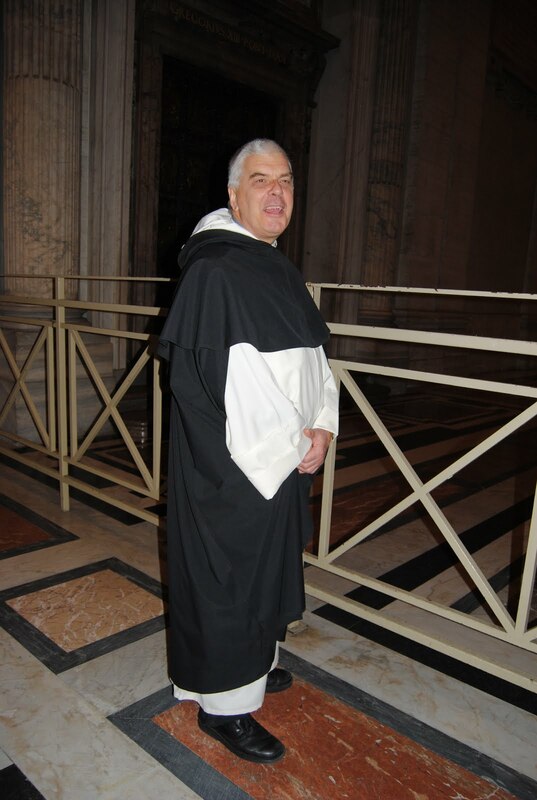 Thiers will be the first episcopal conference or church sui iuris to address the theme of the New Evangelization in plenary. Before the beginning of the lecture, His Beatitude Major Archbishop Moran Mor Baselios Cleemis greeted the assembled students and guests, and made a special point to recognize his dissertation director, Fr. Fred Bliss, SM, from his days as an Angelicum student. As I sat surrounded almost entirely by Indian Catholics, the chanted prayer that began the seminar was one of the more moving spiritual moments I’ve experienced in recent weeks (I am not even sure if it was Hindi or one of the other languages, such as Tamil or Malayalam, I should ask). So, I ran into Robert DeNiro today. Not literally, mind you, what with the security and stage hands and boom operators and thirty other people that go into shooting a short scene, it would have taken a deliberate effort and probably not have been received well to do so literally. 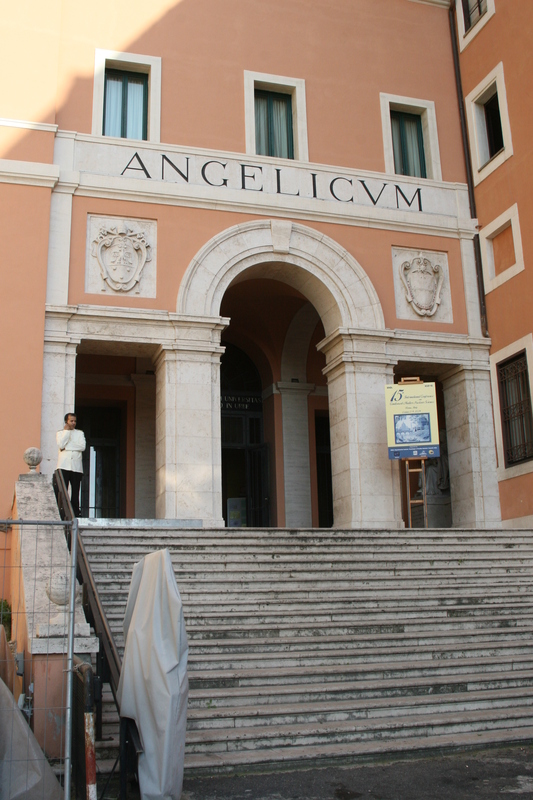 Nevertheless, he and Monica Bellucci were at the Angelicum today shooting for their new movie, Manuale d’amore 3. Unlike my late spring encounter with the hordes of Italian teens outside Castel Sant’Angelo for the stars of the latest Twighlight movie, I might have actually made an effort to get DeNiro’s signature, if it were not so apparent that he was working and that I was supposed to be getting to class. It would have been, as they say, simply brutto. Ah well. Next time! 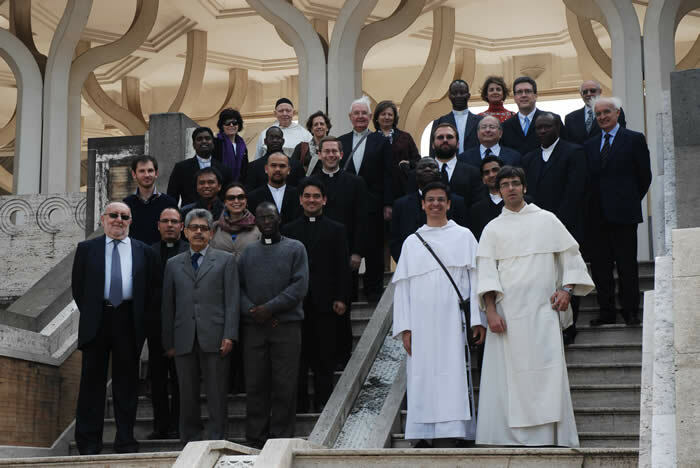 Monday brought us to the Angelicum with a welcome from Irish Dominican Michael Carragher, Vice-Rector and Canon Law Professor, and a brief tour from the new dean of the Theology faculty, Maltese Dominican Joseph Aguis. I learned more about the University in these 20 minutes than my time spent in its classrooms the last year. The university itself is the third oldest in rome, after Sapienza and the Gregorian, but its original location was next to the Pantheon in Santa Maria Sopra Minerva. The building that currently houses the university was originally a convent, repurchased from the government sometime after both sites had been taken in 1870. In what had been the chapter room, and serves now as the Sala de Senato, the full-body relic of an unnamed saint rests in the armor of an imperial roman soldier under the altar, unbeknownst to even some of the faculty who had joined us on our tour. Fr. 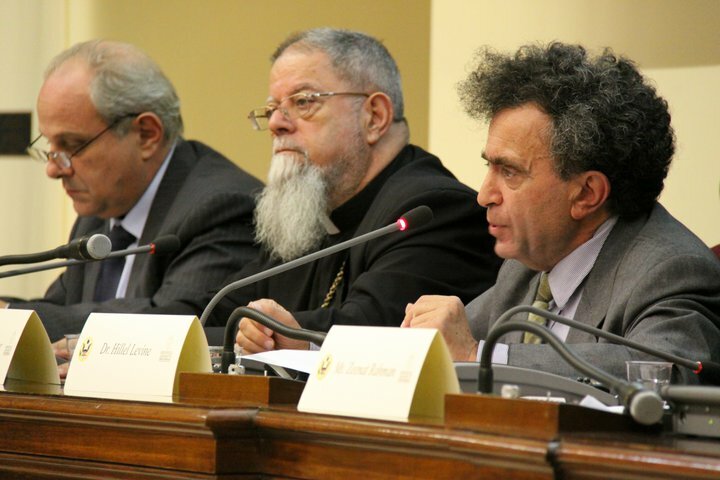 James Puglisi, SA, who serves as director of the ecumenical section and the Centro Pro Unione lead our first academic discussion on the “Commitment of the Catholic Church to Ecumenical and Interreligious Dialogue”. 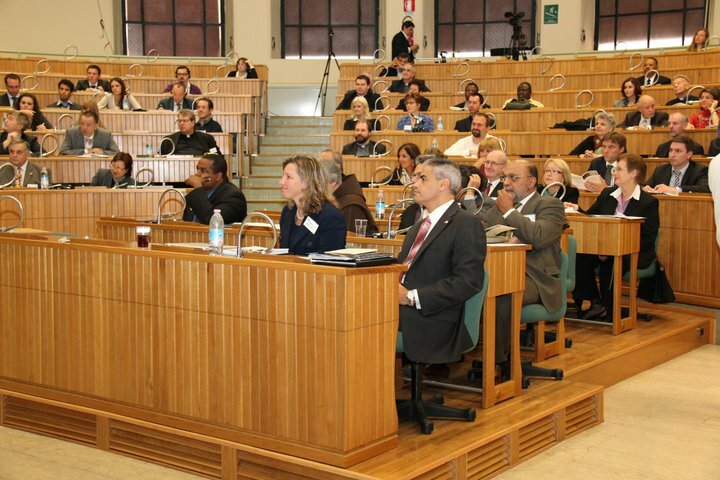 Like many of the presentations throughout the week, the content was review, but would certainly be helpful for those arriving without previous background in ecumenism and interreligious dialogue. We lunched at the Gregorian university bar, which is substantially larger than its Angelicum counterpart. Following lunch, we ran into former Lay Centre resident Dimitrios Keramidas in his new role as secretary of the Missiology faculty at the Gregorian. He gave us an impromptu tour of his office and that of the Institute for the Interdisciplinary Study of Religion and Culture, as well as the Cardinal Bea Centre for Judaic Studies. We were joined there by Irish Jesuit Father Thomas Casey, director of the Bea centre, who introduced us to the research and work of the center, which includes 6000 volumes on Judaism in the Gregorian university library. This was followed by a 90-moinute introduction to the library there, which is the largest in Rome. At this point I calculated that if all the pontifical universities in Rome combined their libraries into a single collection, or at least a single system to which all pontifical students had access, it would be almost as large as the Hesburgh Memorial Library at Notre Dame. We returned to the Lay Centre for celebration of the Eucharist with the Theologian of the Papal Household, Polish Dominican Wojciech Giertych. This was followed by a dual-presentation and discussion over dinner with Fr. Giertych and Gerard O’Connell, Rome correspondent for the Union of Catholic Asia News service and author of God’s Invisible Hand, a biography of Cardinal Francis Arinze. 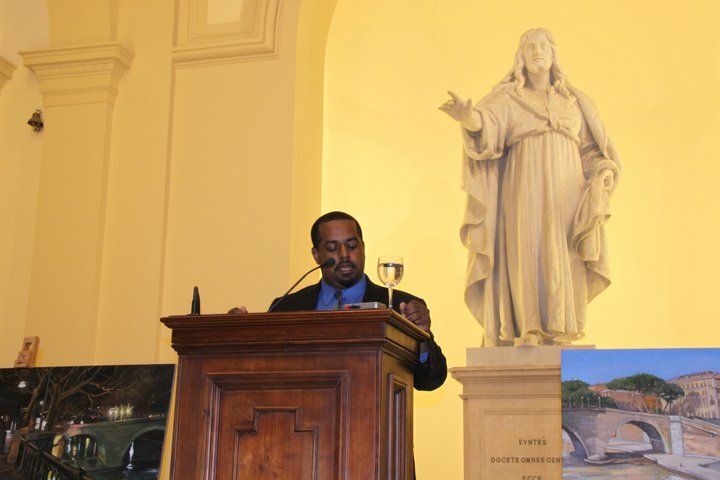 The topic of their presentations was, “Issues that Matter to the Holy See: Seeing Interreligious Dialogue in its Broader Context”. The views were decidedly different, but not necessarily in opposition. Clearly a journalist and a theologian have different constituencies, frames of reference, and sensitivities when observing the Holy See; both men have had several years of doing so. Fr. Giertych raised a few hackles among some fellows with comments that grace comes through Christ and not through Buddha or Muhammad, but others countered that this is simply classical Christocentricism, inclusivist though it may be and in contrast to a more pluralistic view that is popularly construed as the most popular approach. (Whether it is or not is another discussion). At the least, it is helpful to be reminded that even in the administration of a papacy that is clearly pro-dialogue, there exist different methodologies and approaches to dialogue.